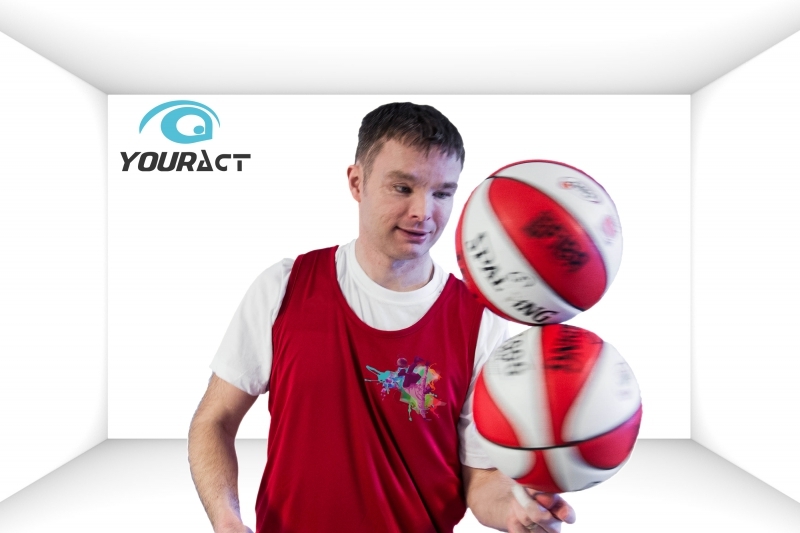 » Tommy Baker – Basketball Freestyle Show - YOURACT! Riding on the great success of last years NBA event Tommy Baker was invited to perform once again at the Jam Session 2009. This year it was based at the Convention Centre, Phoenix, Arizona. The Jam Session caters for ten's of thousands of basketball crazy fans that visit a different US city each year for the main event, 'All-Star Weekend'. The Jam Session provides everything the fans would ever dream about basketball, with interactivity and great spectacles to watch throughout their visit. Tommy performed everyday from February 11-16 and inspired thousands of fans along the way; footage to follow shortly.... Tommy also performed in the build up to the 2008 NBA Live Tour (London). Tommy performed and ran his 'Master Classes' at the annual basketball 'Superstar Camps' for young elite european basketball players in 2004, 2005 & 2006. Venue: Berlin, Germany. 2008 NBA Live Tour (UK). Tommy also performed at the Adidas Store in London (UK) during a visit from some of the NBA players. 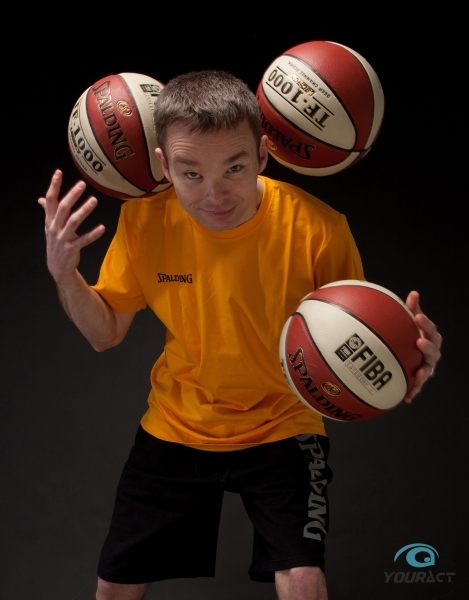 On February 15 & 16, 2009 Guinness World Records invited Tommy to set three new world records with his unique basketball skills. The Phoenix Convention Centre provided the venue during the NBA Jam Session 2009. All 3 records are featured with a great action photo of Tommy in the "Guinness Book Of Records 2010" on pages 238-239. This edition of the book remains on sale in the shops until around November 2009 when stocks normally run out. Tommy also held an earlier record detailed in the 2003, 2004 & 2006 annual editions of the Guinness World Records book. “Nike Freestyle Campaign II” – Tommy was featured as the goal keeper in this high profile marketing campaign and worked alongside Brazilian football legend Ronaldinho. The commercial was filmed in Rome, Italy. Tommy performed his halftime show at the National Indoor Arena in Birmingham (2007). He met with the team before hand and swapped some creative ideas for basketball tricks. Tommy performed throughout the day in the fan zones for 'Destination Ford' at the final of Europe's most prestigious football competition. Then after the game Tommy 'Meeted & Greeted' the invited guests of Ford with his freestyle and juggling. Tommy performed at the Champions League Final with Ford in 2002, 2003, 2004 & 2005. Destination Ford invited Tommy along with football trickster Rob Walters to perform at the Birmingham Motor Show (UK) in 2002 and then again the following year at the 2003 German Motor Show in Frankfurt. Tommy won his first 'Streetgodz' basketball freestyle competition in New York, USA. In the bulid up to the NBA All-Star weekend, Tommy went head-to-head competing against the world’s best basketball tricksters and won the $2000.00 title prize money from Red Bull. The 23rd edition of the “Air Jordan” shoes were launched in at West Bank Mall, New Orleans, USA in 2007. The popular 'Streetgodz' freestlye competition was used as the catalyst for this major marketing event. Tommy was invited to defend his 'Streetgodz' title as he managed to win his back-to-back 'Streetgodz' freestyle championship against some tough competition. A fashion show in Padova, Italy (2007) was the setting for Tommy as he walked down the catwalk as a 'roady' to open the themed night with a skills demonstration for the youth clothing brand Diesel, in front of 800 Diesel executives from all over the world. Tommy performed his show and talked of his 'olympic lifestyle values' on his career at an annual weekend retreat in 2006. It was such a success that Sony invited Tommy back the following year to perform and run some master classes for the team. Afterwards Tommy talked a bit about his daily training and took questions on his career goals and dreams. A brand new store opening in Marina Mall in Kuwait City, Kuwait (2007) was the setting for Tommy as he drew in the crowds for this new shopping venue from Footlocker. 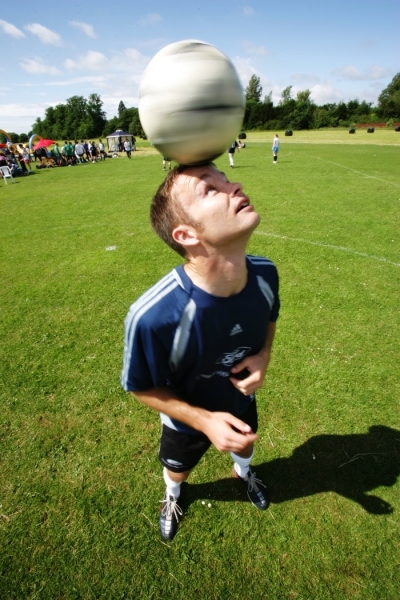 Tommy performs his tricks providing football entertainment in the pre-game fan zone. He gets the crowds involved at this major final in central Glasgow, UK (2007). Based on the great success earlier in the year at the 'UEFA Cup Football Final' fan zone, Tommy was invited back to engage with the passionate football crowds at the 'Super Cup Final' fan zone in Monaco (2007). 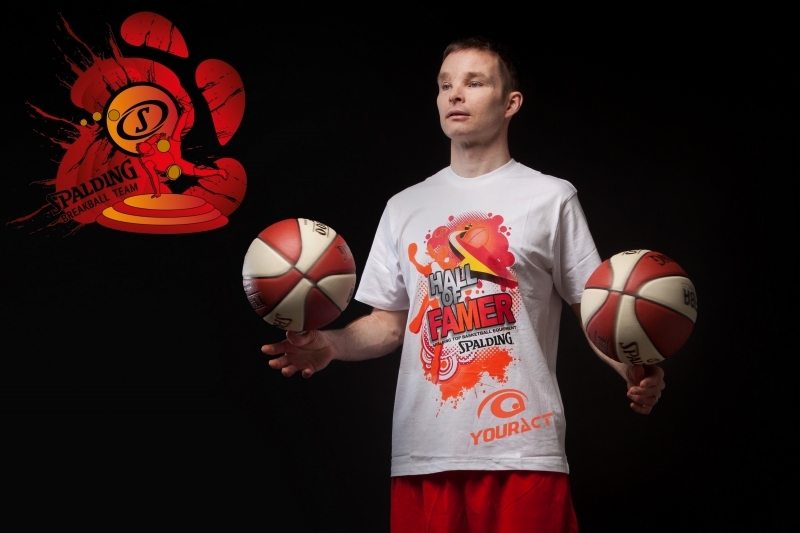 A two week tour across Europe in 2006 saw Tommy establish new career highs with his streetball freestyle show. The 8 part TV series called “Streetball Extreme” continues to be featured on the Extreme Sports TV Channel. Die Bühne bzw. die Auftrittsfläche sollte eine Mindestgröße von 3m x 3m x 3m (Breite x Tiefe x Höhe) haben. Der Auftrittsbereich muss eben und rutschfest sein. Es wird eine für das Event angemessene Anlage benötigt, sowie einen Techniker, der diese bedient. Falls Lichttechnik vorhanden ist, dann wäre rotes, blaues oder lila Licht und ggf. Nebel wünschenswert. 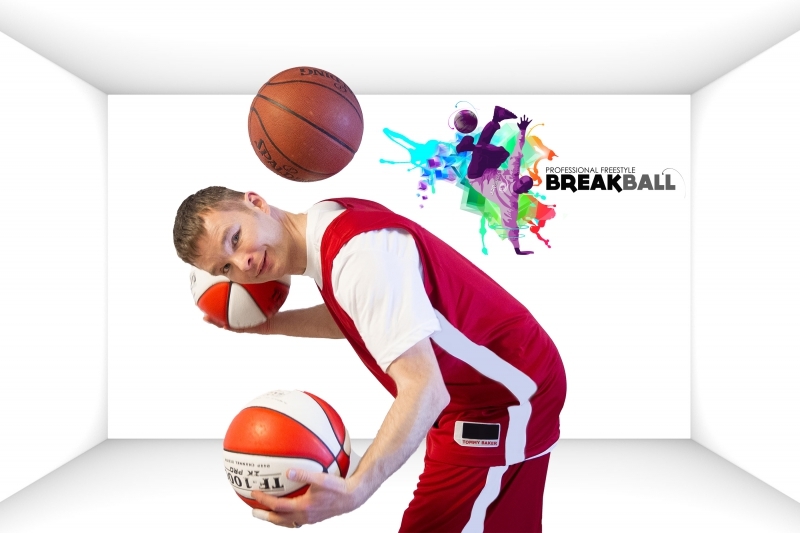 Richtig gewähltes Bühnenlicht kann eine Show allerdings stimmungsvoll bereichern..
Tommy Baker ist das neueste Mitglied des erfolgreichsten Basketball Show Teams in Europa „Das International Breakball Team„. 2000 bis Heute ist er der erfolgreichste und bekannteste Freestyler der Welt. Seine Videos wurde von Millionen auf Youtube gesehen und gefeiert. 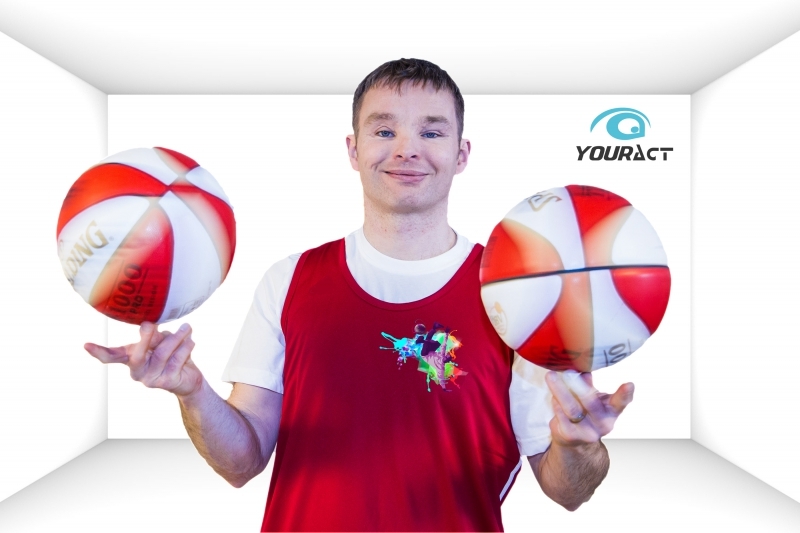 Tommys Freestyle-Moves fasziniert selbst Hollywood Stars, NBA und Fußball-Legenden Weltweit. Sogar die legendären Harlem Globetrotter waren stark von Tommys Freestyle-Talent inspiriert. 2013 gab es das erste Treffen der Freestyler Legenden Mehmet Kekec (Deutschland) und Tommy Baker (UK), in München. Tommy Baker war fasziniert von der perfekten Mischung der Show-Produktion „Audi Freestyle„, die von Mehmet Kekec erstellt wurde ist. So beschloß er ein festes Mitglied des BREAKBALL TEAMS zu werden. Tommy Baker ist 4-facher Guinness Weltrekordhalter seit 2004. Seine atemberaubende Basketball/Fußball-Freestyle-Fähigkeiten sorgen für einzigartige Momente bei Events auf der ganzen Welt. Tommys Freestyle- Unterhaltungsprogramm bei seinen Live-Auftritten, ist für Jung & Alt gleichermaßen aufregend. Bei den Interaktionen mit seinem Publikum liefert Tommy feinstes Basketball- Entertainment und schafft einmalige emotional Augenblicke. Hier geht es zu Tommy Bakers Website!